After searching for some vintage metal lockers for storing all my art supplies and photography equipment, I finally found the perfect set on Craigslist for a reasonable price, so Saturday morning, we headed to downtown Denver to pick them up. We were confused when we arrived at the address and didn't find a house, but rather an old mansion that looked more like a hotel. After standing outside for a few minutes wondering if someone was going to meet us outside, we opened the tall black iron gate and knocked on the door. The man who answered was in fact the man who had placed the for-sale ad, and the mansion was a murder mystery dinner theater and bed and breakfast that he and his wife owned and live in. He led us toward a secret door that was concealed by a bookcase - so very Nancy Drew! - and down a narrow staircase to the basement. Amidst piles of theater props, makeup and costumes were the lockers, perfect with their rusted, peeling paint. I wished we could look around the old house and discover all its secrets, but business was done and we had work to do on our own house that day. The rest of the day was spent doing demo work on our fireplace wall, tearing out all the drywall that formed the 90's style cubbies, in order for Jamie to put in classic built-ins on either side of the fireplace, a brick frame and hearth, and a real mantle. It's going to look so amazing, but we will be living in a construction zone for a while now. The day was exhausting, and I don't remember working so hard in a long time (maybe not since moving day), and even today, all of my muscles are reminding me of what a day of tearing out drywall feels like. I took a shower, and Jamie sweetly went to pick up sushi for dinner, along with a jar of lime curd that I needed for this cake. I've never been all that into St. Patrick's Day, but that said, I am always into celebrating an occasion with cake. 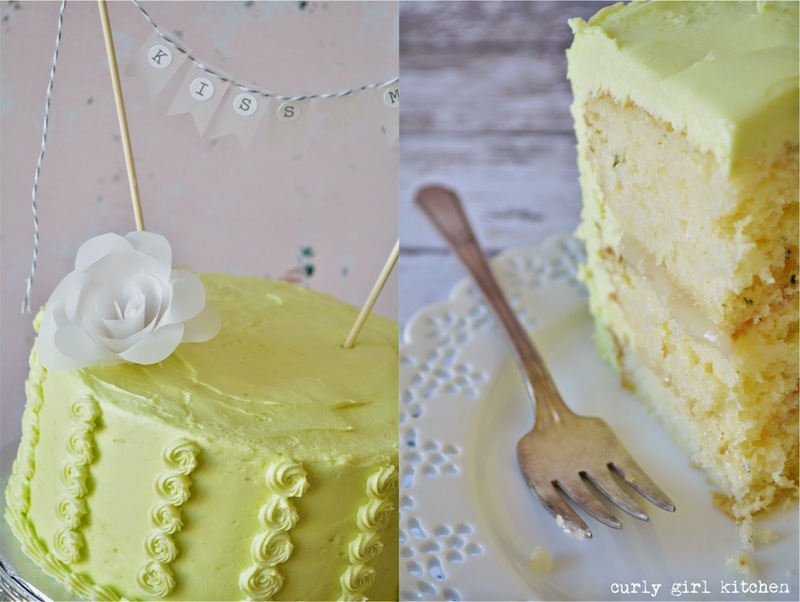 I keep a list of ideas for cake recipes, decorating ideas, and general inspiration with me at all times, and it's a longer list than I could ever hope to get through, but as I was scanning through it the other day, I saw my note for a "mint and lime cake", and decided that now was the time to write up the recipe. 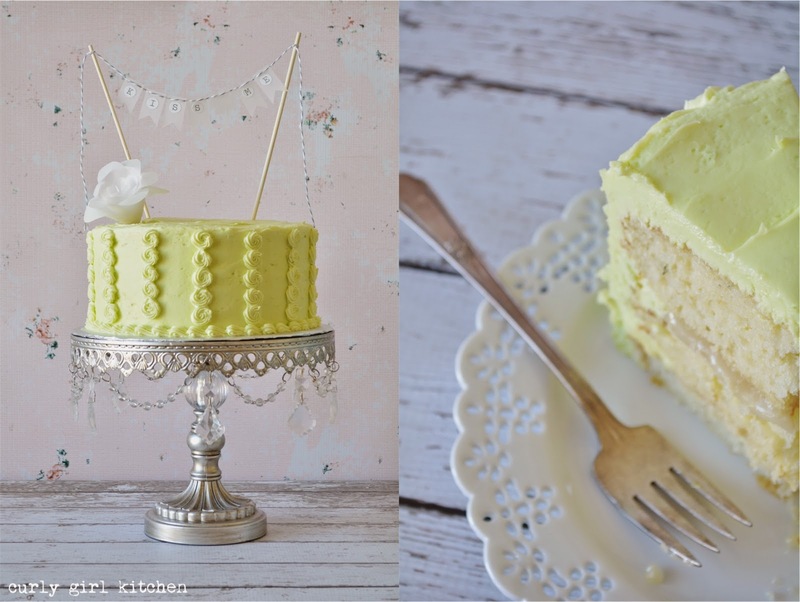 Since mint and lime are both fresh and green, it seemed like the perfect combination for a St. Patrick's Day cake, especially considering this beautiful spring weather we've been enjoying lately. After such a long day, and with more work to do on Sunday, I opted for store-bought lime curd instead of making my own. The ironic part was that suddenly, every grocery store in our neighborhood seemed to no longer carry lime curd, so Jamie ended up bringing home a jar of key lime pastry filling, which was actually very good, delightfully tart, and not too sweet. It made for a good substitution. 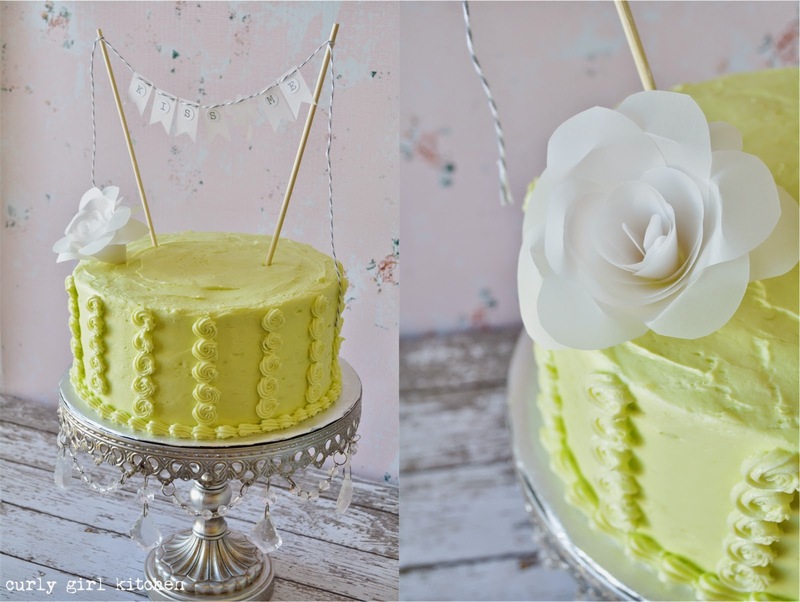 The mint cake is light and airy, subtly scented with fresh mint leaves. 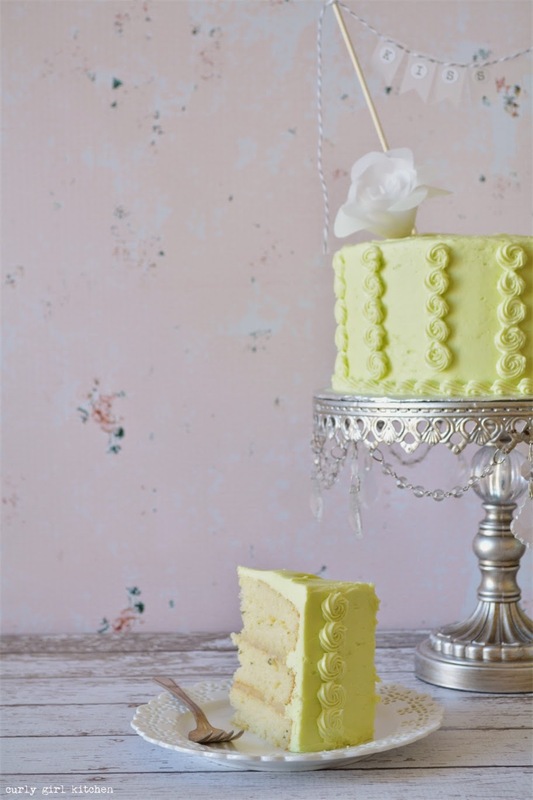 Filled with the tart key lime pastry filling and frosted with zesty lime cream cheese buttercream, it tastes like a spring day, if spring could be epitomized in a cake. 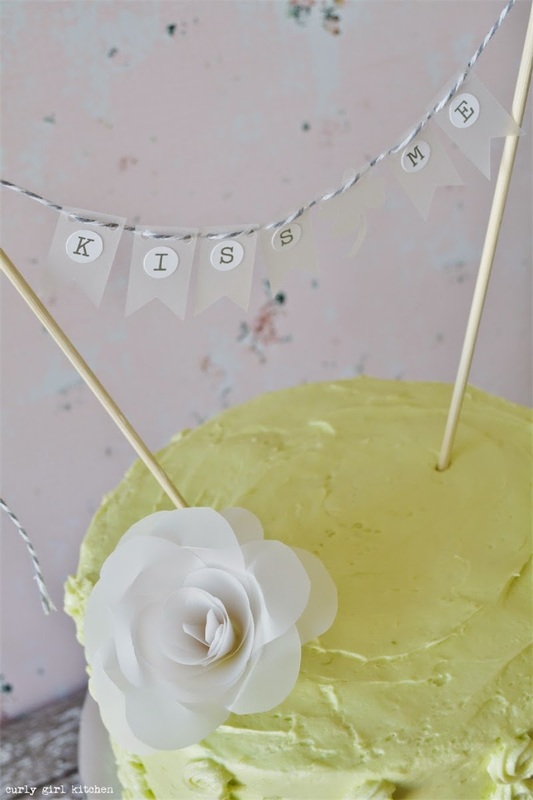 I piped small rosettes for a simple decoration, and topped the cake with a white paper flower and "kiss me" bunting. So sweet and pretty. Take half the mint leaves, crush slightly with a fork, and place in a bowl. Warm the milk until hot to the touch; pour over the leaves and let steep for 1 hour. Strain the milk and discard the leaves. Finely chop the remaining mint leaves. Preheat the oven to 350 and grease three 8-inch cake pans. In a large bowl, whisk together the chopped mint, milk, cake mix, eggs, sour cream, olive oil and vanilla until smooth. Divide between the cake pans and bake for 18-20 minutes, until a toothpick comes out clean. Cool completely. In the bowl of your stand mixer fitted with the whisk attachment, beat the butter, cream cheese and lime zest until smooth. Add the powdered sugar and meringue powder on low to combine, then beat for several minutes until fluffy. 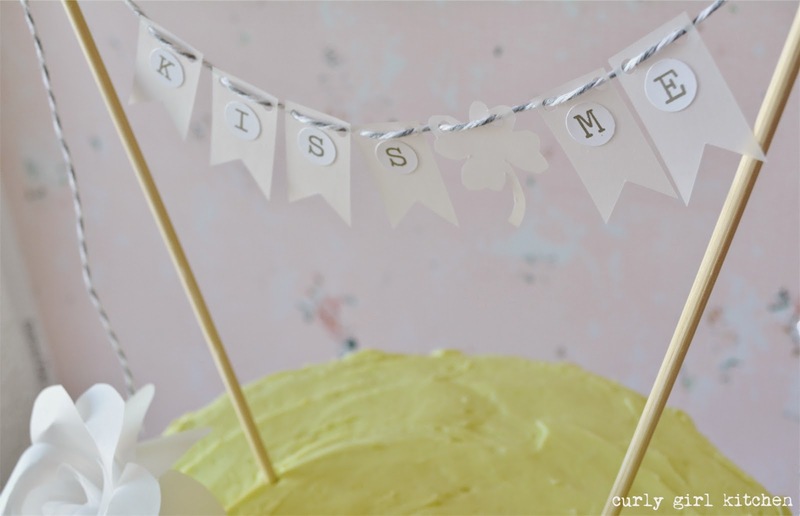 To assemble, place one cake, bottom side up, on a cake pedestal or cake board. Spread with half the lime curd. 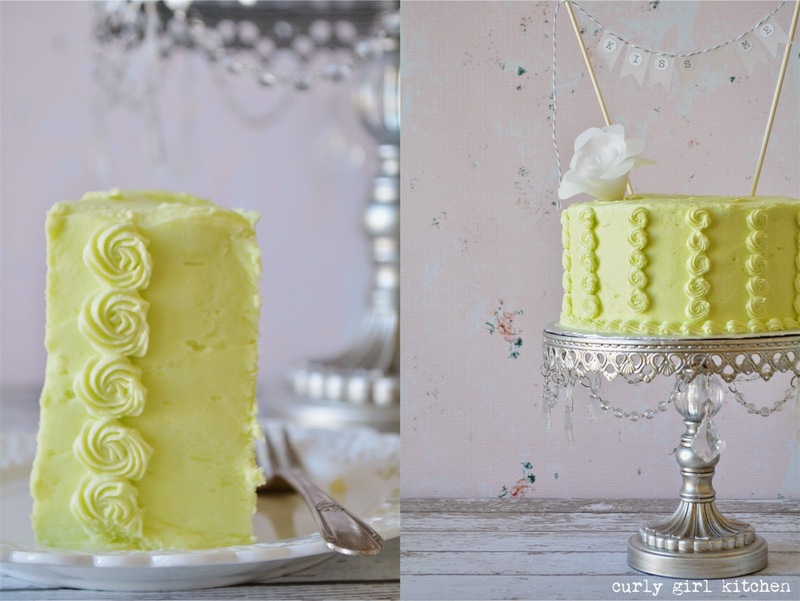 Repeat with a second layer of cake and the rest of the lime curd, then place the last cake on top. Frost all over with a thin crumb coat of buttercream, chill for 30 minutes, then frost with a final coat. Wow! It sounds like you had quite the adventure purchasing the cabinets. It would have been fun to explore that mansion. 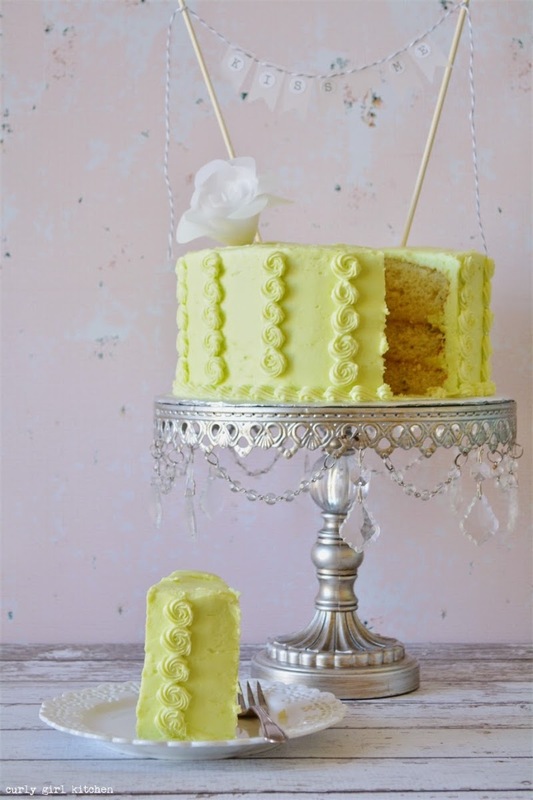 And this cake. . .it looks so light and refreshing. . .the perfect treat to get me in a spring-time state of mind. I'm also loving that cake stand. Where ever did you find that? I'll admit I was a little nervous at first when he took us down to the basement, haha. 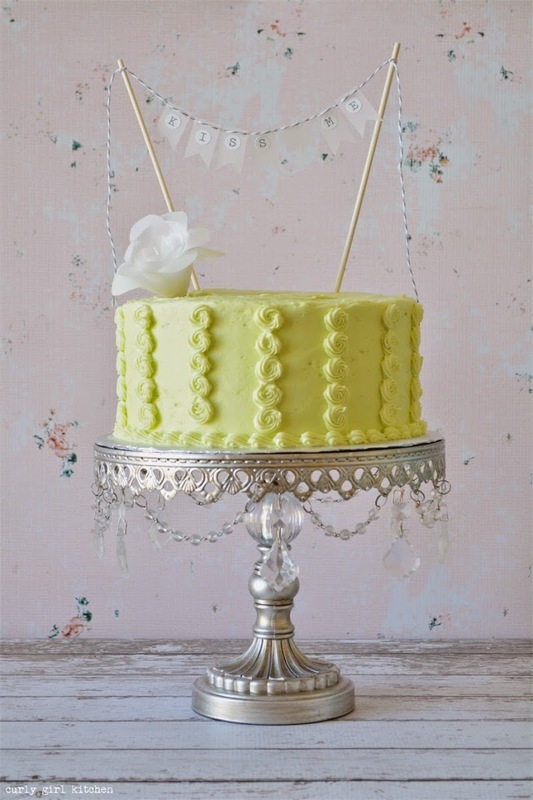 :) I got that cake stand online at Lamps Plus! 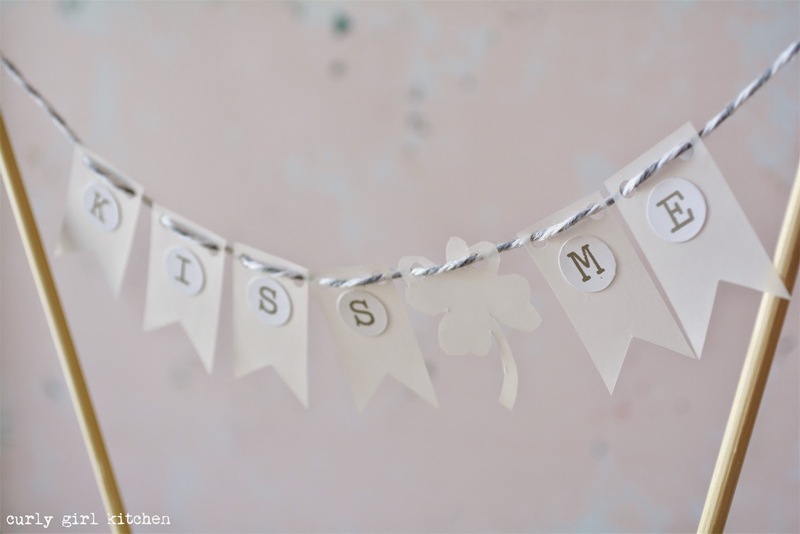 It is so sweet I bet you made your bunting..Great idea the lockers!Fun adventure.. 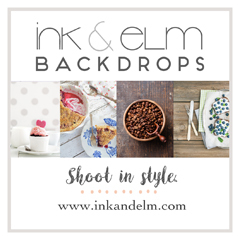 I sure will - as soon as a few projects are finished, I'll be posting some before and after photos! This cake is perfect! And so beautiful too.. I wish I had a slice now.